Fast and Easy Keto Breakfast Ideas are a compilation of tasty everyday go-to breakfasts that will keep you on your low carb and keto plan. Breakfast is the hardest meal to figure out and make when you’re in a hurry. With a keto diet the old carb standbys won’t work. Each recipe is quick to make and most are make ahead meals which makes them perfect for the morning rush! I don’t know about you, but breakfast makes or breaks how I feel during the day – especially the first half of the day. A bad breakfast sets the tone for my day. High protein, low carb meals work best for keeping my hunger at bay. I used to have cereal, a muffin, or toast on the way to work but then I realized I would be hungry an hour later. Carbs make me tired and hungry – and sometimes grumpy! No one wants to start out their morning grumpy! We are all super busy and need fast, make ahead, or on-the-go breakfasts, right? 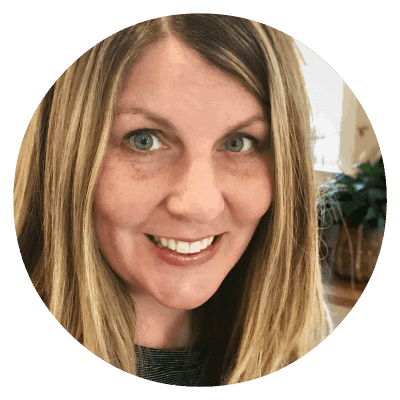 So many awesome looking low carb and keto recipes just take too long to make. I save those for the weekends! To get you through a busy morning, try these fast and easy keto breakfast ideas! Made with a version of fathead dough, It’s Simple How to This and That has come up with this VERY tasty breakfast biscuit stuffed with sausage and cheese that I am in love with. These are great because they are portable and can be made ahead. Perfect if you’re busy! 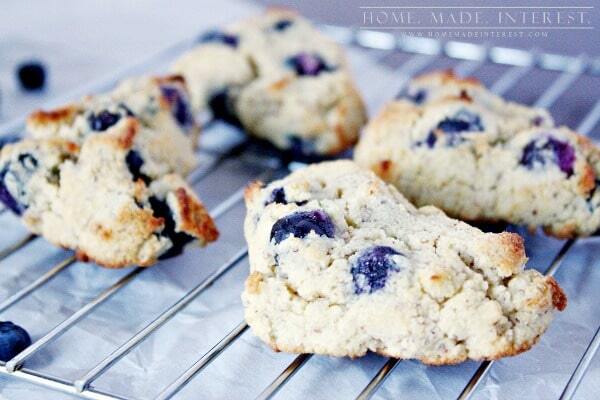 This blueberry scone recipes from Home Made Interest is a delicious low carb version of my favorite blueberry scone. I was super excited to find this recipe! Just like they say in their post, these do come out light and fluffy! 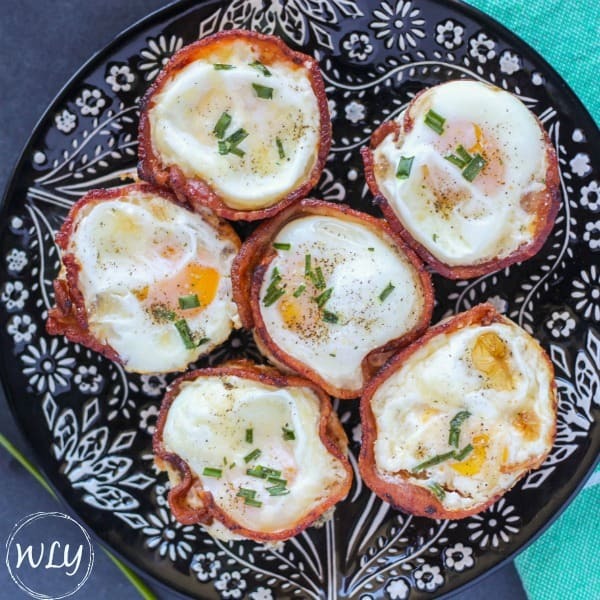 Low Carb Creamy Bacon and Egg Cups (super EASY make ahead option!). This is an awesome recipe created by my sister Jen from Whole Lotta Yum (shameless plug, thanks for the yummy recipe sis! :-)). Another super fast and easy breakfast idea. 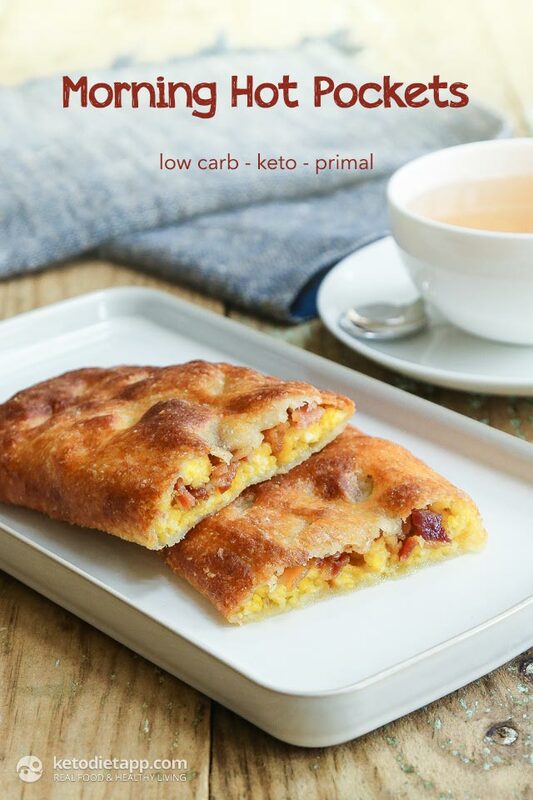 Check out Listotic’s recipe, 90-second keto bread in the microwave. I have made this several times and it is really good. After I toast the bread I spread almond butter. My alternate is a bacon (ham or sausage works too), egg and cheese breakfast sandwich. YUM! Another tip, I accidentally left the oil out when I made this recipe once. It did not make a large noticeable difference other than the version with the oil made the texture lighter and fluffier. Also, I did not have coconut flour on hand so I used 4 Tbsp. of almond flour instead of the recipe quantities and it turned out great! I make this recipe at work a lot. In a microwave safe dish, warm up 1 precooked sausage patty, crack 1 or 2 eggs over the top and cook 1 more minute. Cook the egg(s) to your liking adding 10 second intervals. Sprinkle with cheese if desired. You can also use sausage crumbles, bacon crumbles, etc. I use this egg cooker every day, and I have one at work. I literally keep a dozen eggs and some frozen sausage patties (or links), and some pre-cooked bacon on hand. Now everyone in the office keeps trying to steel my egg cooker! LOL! 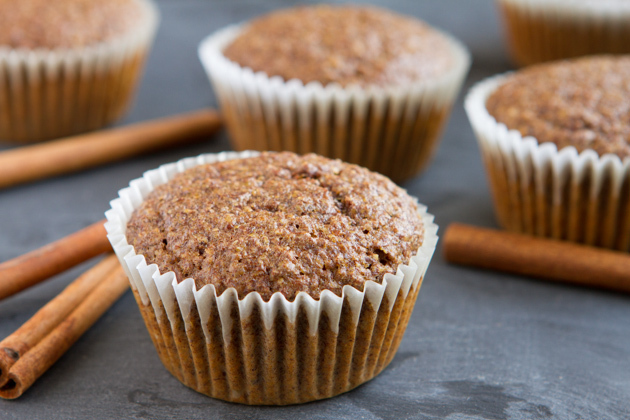 Found this recipe for Flaxseed Cinnamon Bun Muffins at Healthful Pursuits. I made them this past weekend and they are fantastic. The texture and taste are great. I would recommend baking them and them keeping in the freezer to preserve freshness and to have on hand for quick breakfasts or snack.